The death toll from California's hepatitis A outbreak has reached 19, one week after the state's governor issued a health state of emergency. A local city councilman has called for state environment researchers to test San Diego's drinking water for faecal contamination, which causes the liver disease. 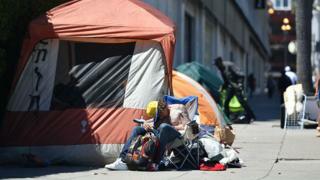 The outbreak has taken a severe toll on the state's large homeless populations, which are most at risk as they do not have access to basic hygiene and sanitation, experts say. The virus is transmitted from faeces to mouth, which means it is most likely to spread in unsanitary conditions. More than 5,000 people are sleeping unsheltered in San Diego - a 10% increase from the year before - according to a recent study by the Regional Task Force on the Homeless. Symptoms include fever, fatigue, abdominal pain, nausea and vomiting. Jaundice, or yellowing of the skin and eyes, is also a possible symptom. On 13 October, Governor Jerry Brown issued a state of emergency in order to ensure that vaccines reach medical clinics who are working with the homeless.